For Fanatec users, it may be worth going ahead and reinstalling the wheel driver since Windows 10's recent updates. This past weekend, when going to play Forza Motorsport 7 with my Fanatec CSR, I noticed that the driver for my wheel got the boot. Without installing the driver, the wheel worked but without force feedback. Upon reinstalling the driver, force feedback has returned. NOTE: this does NOT add soft locking, ask T10. @CoolSnake for the Hot Tip. Is the FFB fixed? No. What steering mode should I use? There are multiple systems layered together to create Normal steering. Forza is known for being controllable and natural on a gamepad and these system are a major component of that feeling. While I won't explain every system involved I will say that Simulation Steering turns these systems off. I'll also confirm that the input layers of these systems are turned off any time you use a wheel, regardless of the steering setting. Why does sim steering have an effect? Still looking at this one. There’s no difference in the FFB code or tuning for these functions. Soft locking is a thing in FM7 now? We're working toward soft locking with the ultimate goal being to leave your DOR at max and handle lock through the game. This is a very high priority for us. It isn’t exclusive to the Elite and may be the cause of several issues seen here. We didn’t have a set of Heusinkvelds to try but we will now. I have a set on their way and we’ll look into this. The problem is that the default profile which is used whenever there is a device that has no built-in profile has very conservative values for FFB which often cannot be compensated by increasing values for FFB in-game. This might be the reason why some users who use wheels which do not have built-in profile, suffer from weak FFB effects, simply because the default profile has comparitely low values for FFB. Thanks. We found this issue at the same time as you and will be fixing it. I’ve looked into the left pull in rumble (specifically the one in the video) and we understand where it’s coming from. We’re investigating why that force would increase with time. What firmware are you on? The issue with the G920 is very different. We’re aware of this one. It’s surprisingly difficult to reproduce in house. I’ve only seen it by leaving my game/wheel idling for several days. We are looking into it along with the G920 issue. The commonality here seems to be that they always pull left. Hello everyone. My name is Aaron and I'm a designer at Turn 10. I've read several of the concerns here and wanted to address as many of them as possible. Please update both your firmware and drivers to the latest versions approved by your wheel manufacturer. Over the development of FM7 we worked closely with wheel manufacturers to ensure our game worked with their wheels correctly. In some cases this required driver and/or firmware updates. A list of officially supported drivers will be up soon but for now it's best to search the manufacturer site for your specific wheel. In the case where your wheel has an Xbox mode it's best to install the driver and run it in PC mode. While it will work in Xbox mode with Forza Motorsport 7 on PC the experience will be better in PC mode as you can tune the driver settings to your liking. Specific to Thrustmaster devices on PC please use a USB 2.0 port. 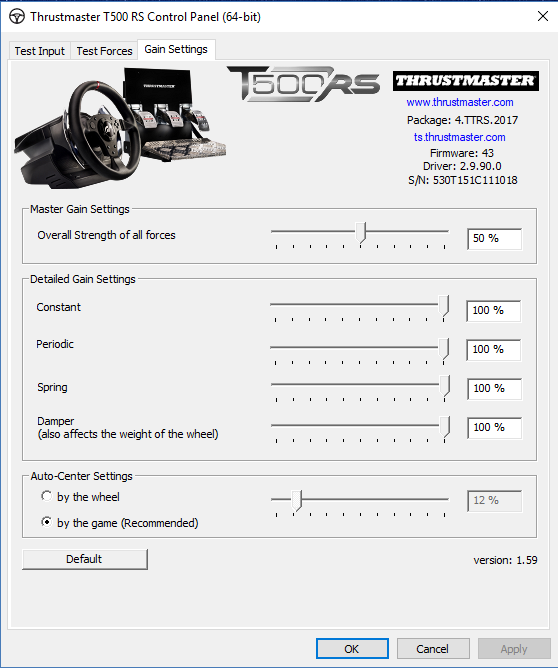 The Thrustmaster driver appears to have issues with USB 3.0/3.1 recognition. This issue is ubiquitous across all games and not specific to FM7. The tuning in Forza Motorsport 7 was done using the out-of-box settings for all wheels. If you have driver or wheel settings from another title it's suggested that you start with the defaults and tune to your liking. While the Forza Horizon 3 settings menu appears the same the underlying force feedback is not. It's best to start from scratch. The steering axis inside deadzone should be 0. Steering Sensitivity should engage soft locks instead of altering linearity. I'd strongly suggest setting your DOR in your driver settings. Let's keep it clean and keep the feedback coming. If you try your wheel and make a comment in here it'd be appreciated if you post your setup, driver and firmware. We are committed to an accurate, tactile and enjoyable force feedback experience. Objective and detailed feedback is appreciated. Thought this might be of some use, its a better/more accurate description of advanced settings thanks to Aaron. Center spring scale: the spring is the force pulling the steering wheel toward center; that is to say gravity through caster, KPI and scrub radius. This force is overcome at speed through pneumatic and mechanical trail, the causes of align torque. It's an active force in Forza Motorsport 7 and at racing speed it's very minimal. If the goal is raw trail the community is very much on the right track. Setting the damper and spring to 0 removes most of the tricks. Reduce rumble until you can barely just feel it. Reducing Force Feedback Understeer will increase the trail effects and contribute to oversteer feel. 0 is okay here but may be excessive for some. At 0 a good drifter should be able to link turns without touching the wheel, it'll just follow through. FFB Understeer is working, it’s just very subtle and masked by other forces. Try leaving FFB minimum at the default setting. This will, roughly, give you pneumatic in raw. FFB Minimum alters the ramp-up of pneumatic trail (somewhat counterintuitively) . Turning it down all the way is almost like having a flat tire; high forces at low lateral loads. I’m looking at the center feel and have identified a couple areas where we can calculate it better. Noted. Thanks. 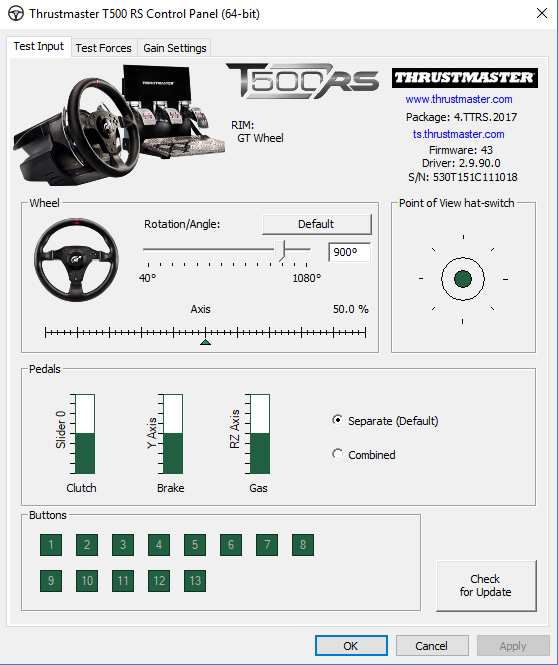 Somewhat simplified here but the game sends the wheel a normalized torque value. In general, the wheel processes that value as a scale of its total available torque. In a pure linear wheel with no tricks this torque is what you get. Some wheels and drivers may scale that value (FF) or add to it (dampers and springs) depending on your settings. This is what happens with Fanatecs FF setting. I noted it earlier but it may have been buried. The FFB setting in game isn’t an overall gain setting. It’s specific to the align torque function and strongly related to both the understeer dropoff and oversteer feel/follow through. It also scales rumble outputs. You can set your wheel wherever best suits you. I generally suggest setting the game FFB high and use the wheel for gain. This retains as much align torque as possible.This may be why some people prefer such small spring and damper values, as moving all three values is analogous to reducing gain. Specific to Fanatec on Xbox or PC in Xbox mode (green ring), high FF values scale torques up substantially and will cause clipping. If you run a Fanatec in Xbox mode I recommend setting the wheel FF around 35 as a starting point. 50% in TM Control Panel = 80% strength. (Its hot where I live, motor preservation). And is that a return of the customer motion rig complete with the custom view minus the steering wheel on screen that they don't think we actually want in the finished product? First thing I noticed in the ISRTV hands on. I wish I could say the same, but a simple addition af a new camera angle isn't going to do it for me, I'm dying to find out what they've done with the simulation of FFB. Turn 10 says it has tested everything from PlayStation DualShocks to pro racing wheels to Guitar Hero controllers, and all of them work with Forza 7 on PC. All this effort making sure all these wheels work is going to be short lived if their FFB is still the same lackluster, discombobulated mess. Q: "Is there any word on updates to wheel physics at all?" A: "There has been huge changes in both the number of wheels supported as well as the FFB effects themselves. This has been a major investment." I really hope it is going to feel really good. Let's hope Dan's word on the wheel support is true, I think going after the PC market they have to have improved this area. Much as I want the wheel support to be good and an hopeful it will be Forza 7 is an instant pre-order for me in any case, or it will be when it arrives on the digital store. I just can't get excited by this. I'm sure it's been said time and time again but it never feels right. Playing Assetto was my biggest mistake because now I compare it to everything. Has there been anymore said about Fanatecs input on FFB for FM7? I'm crossing my fingers so hard that they've managed to nail it this time but I won't get my hopes up. I'll take the words at face value for now. Hopefully they step up and meet the expected pc standard. (see OP). I can already tell that the handling model is nearly identical to Forza 6 Of course they will add the FFB effects that was enhanced/updated in FM3 when so many people complained about after the launch of that game. FFB and handling model are two different things, though they impact each other. The BIGGEST issue with the handling model in recent Forza Motorsport titles, including 7 (deduced from the video), is that it appears the car is simply rotating around one central point (likely center of gravity specific to the car) and the change of direction is simply adjusted by the degree in which the steering wheel turns (in this case and similarly with a controller). What I mean by this is that the change of direction is always lagging because rotation is around the center of the car rather than a model where 4 different axes in play. 2 independent axes in the front wheel (steering) and 2 more for the rear. The steering wheel should have direct impact and immediate impact when the wheel is turned. You can see in the video that Alan is driving - he's turning the wheel and the car is not responding right away as he tries to correct oversteer. The 911 GT2 RS should be a very responsive car to start with. To test this theory try out the 458 on the Nurbergring in FM 6 and you will see what I mean (SIM steering setting). STEERING RESPONSE IS TOO SLOW OR TOO LAGGY. It appears to be the same in FM7 based on the video. you will notice a world of difference in steering response and how quickly the car changes attitude based on user input, especially comparing the same make and car layout! This is one of the biggest reasons Alan from teamvvv.com doesn't like the handling model in FM, he feels like he doesn't have direct control of the car. Like your constantly having to fight the car, instead of attacking the road. ^that has nothing to do with the topic other than because the ffb is broken, you dont get proper information at all from the physics engine through the wheel. Things like you have to counter steer when it should self align etc is why it feels like fighting. If Dan (or someone) would confirm those things are 100% fixed, done to the expected PC standard like all other sims, Id consider pre-ordering. To all those attempting to find out how the FFB is, keep in mind even if people try the demo at E3 we do t know what the settings/ assists are in the game for them. I remember the Forza Horizon demo that was put out felt really bad but when the game actually came out it felt better... Not perfect but much better than the demo. We don't know how many assists are on by default in this demo or what build it is. They can change many things yet before the actual release date. I know in the Forza Apex game even the sliders that were added, to me, was a very nice improvement for the handling. It helped the feel of the car when pushed beyond the edge of grip. I do agree that up to now the best FFB I have ever played was with Asseto Corsa but before we make our opinion lets first wait for the game tocome out and then try it ourselves. If you have any doubts about purchasing it don't preorder the game and wait for the tons of comments that will follow the release. Very disappointing to hear that, I don't get why they don't understand how it's supposed to work. I made a video trying to explain in simple terms what FFB is and where it comes from. Turn 10 really needs to put this issue to rest and do the job properly, adding filters on what they have is only a band aid fix and is not going to solve the issue. This is, unfortunately, the truth of the matter. Demos are for visual/sound only. Gameplay and features continue to be tweaked until almost a month before release. And now that patching in features and fixes is pretty much standard for all games, they can continue to work and tweak them even after the game has hit the shelves. So nothing except the largest sweeping general comments are going to be 100% true for the retail version of the game. The only thing I expected to get from this reveal was a release date and some 4K footage. The rest is going to be a mystery until the game actually comes out. If past experience is any consolation, what we see at e3 is typically what we see in the demo, and is generally pretty close to what we get in the final game (except full access to all features of course). In general there aren't any drastic changes to the gameplay at all. You did a pretty decent job in your vid. This one Betta Lines did for Dirt Rally is also appropriate as (before Dirt's backlash and forced FFB rewrite) Codemasters/T10 do (did? havent checked dirt 4) it the exact same way. EDIT: just checked Dirt 4's setups. They bought across the changes all made in Rally. Offering both options again. I do believe this leaves forza as the last "sim" to not soft lock. Edited by user Wednesday, June 14, 2017 7:23:25 PM(UTC) | Reason: dirt 4 settings. Thanks, I remember watching that video too, once we get the demo I'll probably do the same sort of thing. I really hope T10 starts paying attention to this. Doubt it. I'm convinced its because it's a game engine issue and I've heard they've been using the same engine since 5. Which is coincidentally when the FFB started sucking, from what i hear. All that mean's is that I'm sticking with FM6 for when I want to play with controller and Assetto Corsa and Project Cars for when I want the wheel. I won't even entertain FM7 until someone confirms that the FFB is up to date and playable. Playing those games was seriously like seeing the light after being inside Plato's Cave for so long. FM is the GOAT for controller racing games but when you want to play with a wheel, it's easily last place. They're the McLaren/Honda of FFB while Assetto Corsa and Project Cars are the Mercedes and Ferrari. The issue is they are still using the same method of calculating the FFB since Forza Motorsport 2, wich only had to cater to 270 degree wheels. Instead of re-writing the FFB to make it more realistic for the current 900 degree wheels they try to 'tweak' it, wich simply won't cut the mustard.